Last week I was with a group of senior managers who were coming together to do some planning for business activities. 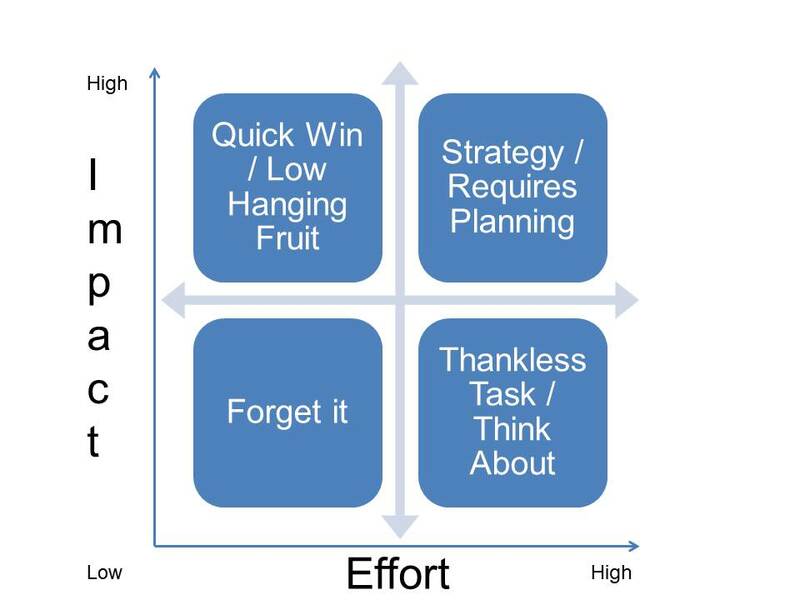 One of the tools I used with them was the Impact / Effort Matrix. I’ve been playing with this tool for years, and am unsure who it’s originally accredited to. I think this is a really useful tool to help with decision making. It forces you to consider the value of the activities or tasks that you’ve made a list of. It can then allow you to do some proper planning around work and resources required. It also helps you to see if you haven’t filled a certain part of the grid, and whether that means you’ve missed an opportunity or need to carefully plan how things will happen. The image is fairly self-explanatory, so I won’t go into the 2×2 format. The two axes are the important pieces to consider. Along the left you consider how much impact the activity/task will have. The key thing here is to define what you’re measuring that impact against. Are you looking at market impact, customer impact, product impact, efficiency impact, service impact, etc. That often ends up being the assumed piece which everyone understands, but if left unexplored can unravel the discussions about what constitutes an impactful activity and what doesn’t. The bottom axis looks at the effort required. If you’re an in-tact team this is fairly well understood by everyone in the team. If you’re working in a cross-functional group or with team members who don’t normally work together, it is worth spending the time here to understand just how much effort is required to achieve a task. As with all tools, play around with it until you get comfortable manipulating it for your purpose. Hi Sukh, Isn’t it that the lower quadrants have to be swopped (forget it & think about)? I would rather work on (think about) a project/feature that is “low impact /low effort” and forget about one that is low impact but high effort (even worse). Did I get something wrong?